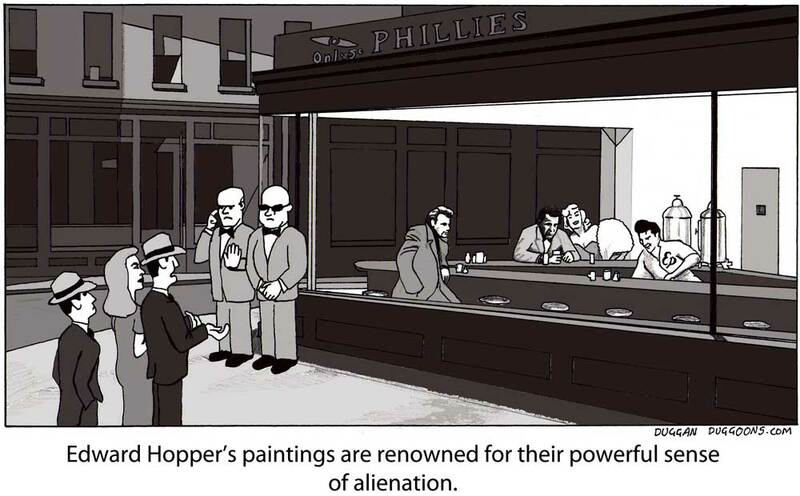 How does Edward Hopper do it? They say that the essence of drama is conflict. And you can’t argue with them or they’ll punch you in the face. But in any case the point is proven by the superlative TV series Game of Thrones. It is the very embodiment of conflict. The variety and number of conflicts, on every scale you can think of, is astonishing. Just like Tarentino, every scene, every interaction, is calculated to maximise the conflict. Uncoincidentally, it is completely compulsive viewing. I was therefore greatly interested to watch a documentary on the writer of G.O.T. George R. R. Martin. He revealed that at the core of his writing process is a quote from William Faulkner’s Nobel Prize acceptance speech. Faulkner said that the only thing worth writing about is “the human heart in conflict with itself”. “And I’ve always agreed with that.” said Martin. “It’s true no matter what genre you’re writing in, even if there are dragons in it or it’s about a private detective or a western gunslinger, it’s still ultimately about the human heart in conflict with itself or it’s not worth reading”. The human heart in conflict with itself – is there a more apt description of the paintings of Edward Hopper? That the essence of drama is conflict is obviously true for a novel, a play or a film. But I believe it is also true for painting. Perhaps I should qualify this to say that it applies to paintings that have an unusual emotional pull. If a painting manages to churn you up in some inexplicable way (call it drama), you can be sure that it has some strongly opposing forces within it. And if you want to understand how that painting works its magic, I find it extremely useful to pinpoint exactly what these opposing forces are. The work of Edward Hopper is some of the most moving and profound in the whole of Western Art. His paintings always incorporate conflict, or opposition, and this is true no matter whether they have several people in them, or just one, or even none at all. How on earth does he do this? 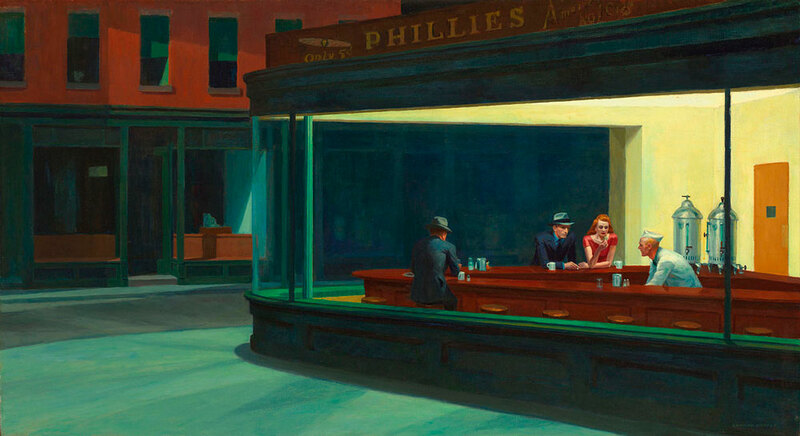 “Nighthawks” is one of Edward Hopper’s greatest paintings and that, of course, is saying a lot. In my opinion, Hopper is the greatest exponent of mood in the static medium of painting. In an age of photography, cinema and everything else, any intelligent realist painter will begin to feel an increasingly agonising need to come up with a good reason why they should paint at all. Hopper’s example is the question’s most convincing answer. Crucially, his paintings are not illustrations of a mood, they are engines designed to create a mood in the viewer. How he does this is so interesting and instructive that I’ll save my thoughts for another, longer blogpost. (I do not merely illustrate frustration, I create it). Anyway, the cartoon. I really went through the ringer for this one. On paper “Nighthawks” should be great fodder for an artoon – it’s got several people in it, in an environment everyone knows, etc. But once I decided to attack it head-on (no decent idea had come into my head in over 2 years of sideways glances) I filled an embarrassing amount of pages in my notebook to get something. I think it was Einstein who said that genius was the taking of infinite pains. Don’t be silly, I am certainly not saying I am a genius! The dots are there for others to join. This iconic painting has been the subject of innumerable parodies, the most famous which is “The Boulevard of Broken Dreams” by Gottfried Helnwein. It shows James Dean, Humphrey Bogart, Marilyn Monroe and Elvis Presley. Hopper’s lonely people clashing somehow with A-list celebrities was the most interesting angle I came up with but I went through a gazillion ways of how to best present it. The bouncers ended up being the key. They always are. Love those guys.